Okay, so the finicky weather isn't cooperating outside (we climbed toward 90 degrees again today) but I refuse to let that stop me from embracing the change of season inside. Now that my fall candles are burning and I've taken my first pumpkin spice cake out the oven, there's no stopping me! I've been playing around in the entryway. I moved the little wicker basket over to the buffet and replaced it with this white metal pitcher. I remembered that I tucked these silk flowers away for a wreath on the front door but decided they were just too pretty for outside. With the addition of this gorgeous ribbon that I found at half price, I must admit I am totally smitten with the arrangement. I love the height they add to the table, too. I realize fake flowers have fallen out of favor for the most part but these are just as pretty as can be and I won't have to do anything but dust them until I'm ready to change this display at Christmas time. 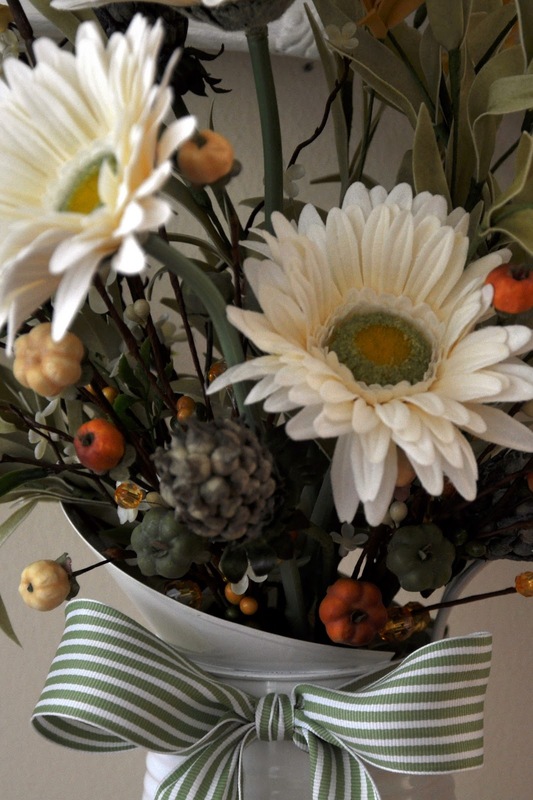 Do you still sneak in an arrangement or two of artificial greens and flowers? I think my cake is cool enough to frost now, so I better get going. Thanks for stopping by, I so appreciate it. Your entry way looks so welcoming! I do use artificial flowers still now and then. Why not? I have to say how blessed your family is to have a wife/mother that is always baking something yummy! I sure wish you were my neighbor! I am just smitten with your arrangement also! And I have to use "fake" flowers, that is the only kind that doesn't wilt when I touch them. I went and got candle warmers, and have fall scented candles on them. The house smells Heavenly!! I also baked the apple cream cheese bundt cake with praline icing from southern living too. Our weather is still warm outside, but the inside of our home is screaming fall. I love the pitcher that you have the flowers in, and can't wait to see what else you do. Ooh, I love this flower arrangement and yes I still use silk flowers as long as they look real like yours. This is all so lovely. 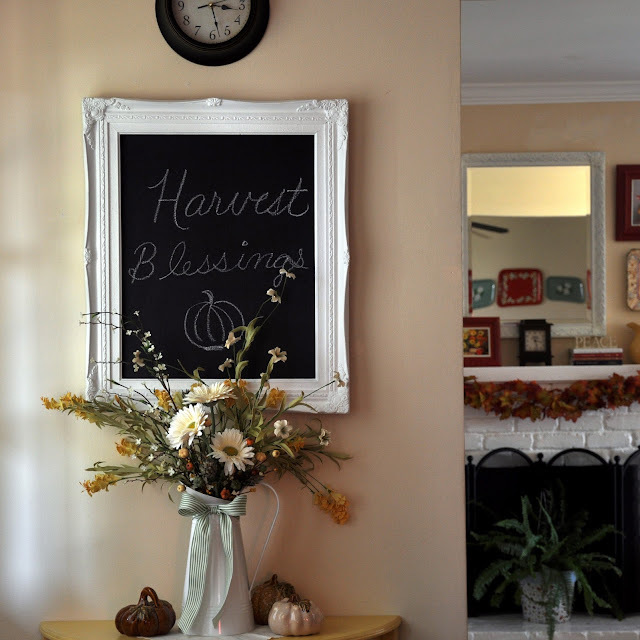 The chalk-board was the perfect finishing touch. It is just gorgeous. Your place is beautiful. I love the fireplace in the background with the swag on the mantle! I wish I had a piece of your cake, sounds yummy! I think faux flowers look great.Your fall decor is nice. Yum, cake!! Love the arrangement, Patty. It all looks so inviting. Perfect in every way, what an eye catcher for all that come to see you. I use to use some silk flowers years ago, but not anymore. I just couldn't stand the dust that seemed to stick to the flowers. I like the look of them though. Your table is a nice welcoming fall hello. 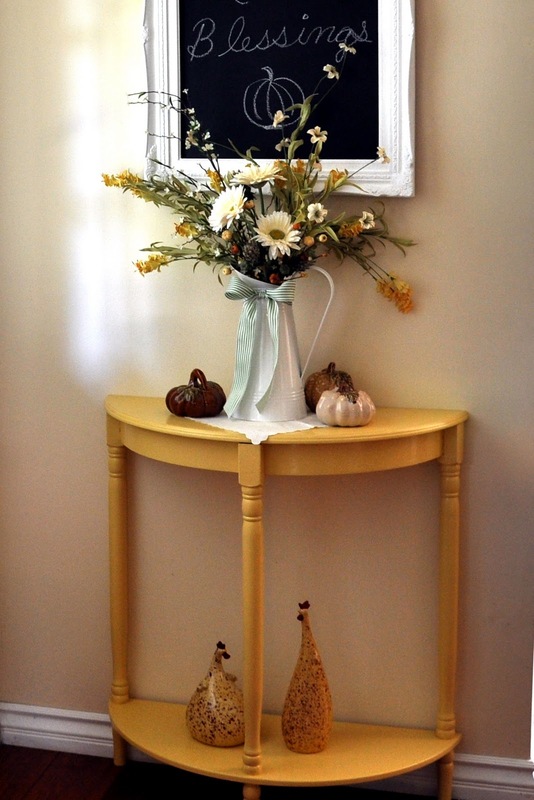 Such a warm and welcoming fall vignette...sooo pretty!!! Lovely. I am dying to get my fall stuff out but we just haven't had the time lately. Life is so crazy right now. Argh!! Your floral arrangement is very attractive. Even though it says "autumn" there is a certain friendly lightness to it. It's so pretty with the ribbon and the little pumpkins. 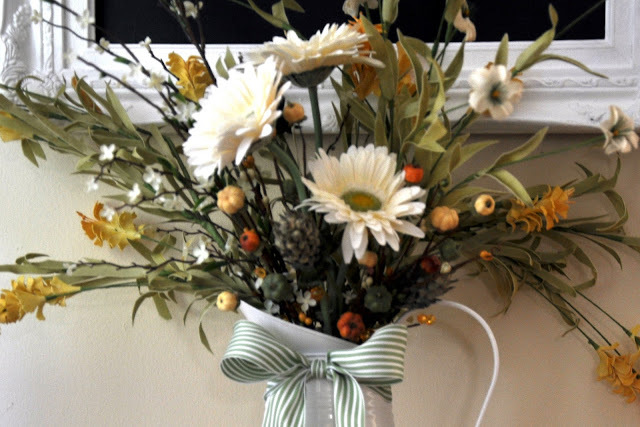 Your floral arrangement is beautiful! And the Pumpkin Spice Cake sounds yummy!!! Fall candles burning and spice cake coming out of the oven...count me in. I am a Fall lover and just reading your words made me smile. You certainly have a touch when it comes to adding beauty to your home. Pumkin spice cake? Yes, please. Your foyer looks so inviting. The flowers look real, not fake. And the little pumpkins are so cute. I am sure I have the same ones in different rooms in my home. Thanks for sharing your lovely entry. 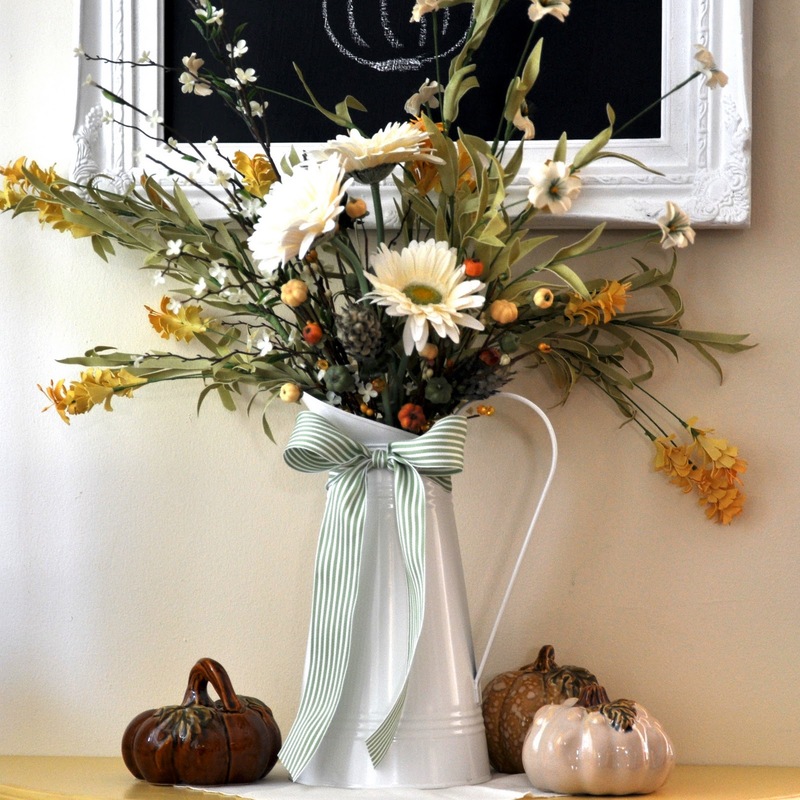 Pumpkin spice cake, wonderful arrangements - great way to celebrate fall! It would be wonderful to have you link your Fall post to Seasonal Sundays. I'm smitten with your fall entry and love the chalkboard! I'm hoping getting out the Halloween and fall decorations will make me feel cool, even if the temperatures outdoors aren't cooperating! Happy Fall! Wonderful to have you be a part of Seasonal Sundays. Perhaps next week if you link a bit earlier, you'll see more traffic. Hope you have a glorious week.